Anon (1979). Post-harvest Food Losses in Developing Countries. Washington, DC: National Academy of Sciences. Aspinall GC and Greenwood CT (1962). Aspects of the chemistry of cereal polysaccharides. J Inst Brew 68:167-178. Ayerst G (1965). Water activity—its significance and measurement in biology. Int Biodeterior Bull 1:13-26. Cahagnier B, Lesage L, and Richard-Molard D (1991). Microbiological quality of grains and ergosterol content. In: Fleurat-Lessard F, Ducom P, eds. Proceedings of 5th Int. Working Conference of Stored Product Protection, Bordeaux, France, Imprimerie du medoc, Vol. I, pp 261-277. Christensen CM (1973). Loss of viability in storage: microflora. Seed Sci Technol 1:547-562. Cooke R and Whipps J (1993). Ecophysiology of Fungi. Oxford: Blackwell. pp 84-110. Demenyk CJ and Sinha RN (1988). Bioenergetics of the larger grain borer Prostephanus truncatus (Horn) (Coleoptera:Bostrichidae) feeding on corn. Res Pop Ecol 32:235-254. Evans P, Persaud KC, McNeish AS, Sneath RW, Hobson N, and Magan N (2000). Evaluation of a radial basis function neural network for determination of wheat quality from electronic nose data. Sens Actuators B 69:348-358. Farag RS, Mohsen SM, Khallil FA, and Basyony AE (1985a). Effect of fungal infection on the chemical composition of wheat, soybean and sesame seeds. Grasas Aceites 36:357-361. Farag RS, Khalil FA, Mohsen SM, and Basyony AE (1985b). Effect of certain fungi on the lipids of wheat kernels. Sesame and soybean seeds. Grasas Aceites 36:362-367. Flannigan B and BanaMSO (1980). Growth and enzyme production in Aspergilli which cause deterioration in stored grain. Cereal Chem 62:137-144. Fleurat-Lessard F (2002). Qualitative reasoning and integrated management of the quality of stored grain: a promising new approach. J Stored Prod Res 38:191-218. Griffin DM (1981). Water and microbial stress. In: Alexander M ed. Advances in Microbial Ecology. Vol. 5. New York: Plenum. pp 91-136. Hall DW (1970). Handling and Storage of Food Grains in Tropical and Sub-tropical Areas. F.A.O. Agricultural Development Paper No. 90, Rome, Italy: Food and Agriculture Organisation. Hamer A, Lacey J, and Magan N (1991). Use of an automatic electrolytic respirometer to study respiration of stored grain. In: Fleurat-Lessard F, Ducom P, eds. Proceedings of 5th Int. Working Conference of Stored Product Protection, Bordeaux, France, Imprimerie du medoc, Vol. I, pp 321-329. Hill RA and Lacey J (1983). Factors determining the microflora of stored barley grain. Ann Appl Biol 102:467-483. Hocking AD and Pitt JI (1979). Water relations of some Penicillium spp. at 25°C. Trans Br Mycol Soc 73:141-145. Jain PC, Lacey J, and Stevens L (1991). Use of API-Zym strips and 4-nitrophenyl substrates to detect and quantify hydrolytic enzymes in media and grain colonised with Aspergillus, Eurotium and Penicillium spp. Mycol Res 95:834-842. Jonsson N, Petterson H, and Schnurer J (2000). Study of the Relationship Between Storage Conditions and the Growth of Moulds and Production of Ochratoxin A in Grain-preliminary Results. Proceedings of European Agricultural Engineering Symposium 2000, UK: Warwick University. Kaminski E, Stawicki S, and Vasowicsz E (1974). Volatile flavour compounds produced by molds of Aspergillus, Penicillium and Fungi imperfecti. Appl Microbiol 27:1001-1004. Karunakaran C, Muir WE, Jayas DS, White NDG, and Abramson D (2001). Safe storage time of high moisture wheat. J Stored Prod Res 37:303-312. Keshri G and Magan N (1998). Use of an electronic nose for early detection and differentiation between spoilage fungi. Lett Appl Microbiol 27:261-264. Keshri G and Magan N (2001). Detection and differentiation between mycotoxigenic and non-mycotoxigenic strains of Fusarium spp. using volatile production profiles and hydrolytic enzymes. J Appl Microbiol 89:825-833. Keshri G, Voysey P, and Magan N (2002). Early detection of spoilage moulds in bread using volatile production patterns and quantitative enzyme assays. J Appl Microbiol 92:165-172. Kreyger J (1972). Drying and Storing Grains, Seeds and Pulses in Temperate Climates. Bulletin 205, Wageningen, The Netherlands: Institute for Storage and processing of Agricultural Products. Labuza T (1974). Interpretation of sorption data in relation to the state of constituent water. In: Duckworth R ed. Water Relations of Foods. London: Academic Press. pp 155-172. Lacey J and Crook B (1988). Fungal and actinomycete spores as pollutants of the workplace and occupational allergens. Ann Occup Hyg 32:515-533. Lacey J and Magan N (1991). Fungi in cereal grains: their occurrence and water and temperature relationships. In: Chelkowski J ed. Cereal Grain. Mycotoxins, Fungi and Quality in Drying and Storage. Amsterdam: Elsevier. pp 77-118. Lacey J, Hill ST, and Edwards MA (1980). Micro-organisms in stored grains: their enumeration and significance. Trop Stored Prod Inf 39:19-33. Lacey J, Ramakrishna N, Hamer A, Magan N, and Marfleet IC (1991). Grain fungi. In: Arora DK, Mukerji KG, Marth EH eds. Handbook of Applied Mycology: Foods and Feeds. New York: Marcel Dekker, Inc. pp 121 -177. Lacey J, Hamer A, and Magan N (1994). Respiration and losses in stored wheat under different environmental conditions. In: Highley E, Wright EJ, Banks HJ, Champ BR eds. Proc. of 6th Int. Working Conference on Stored Product Protection. Vol. II. Canberra, Australia: CAB International. pp 1007-1013. Latif N and Lissik E (1986). Respiration model for heat and heat and moisture release during grain storage. Am Soc Agric Eng, Paper No. 86-6508. Lee HB and Magan N (1999a). Impact of environment and interspecific interactions between spoilage fungi and Asper-gillus ochraceus and ochratoxin production on maize. Int J Food Microbiol 61:11-16. Lee HB and Magan N (1999b). Environmental factors and nutritional utilization patterns affect niche overlap indices between Aspergillus ochraceus and other spoilage fungi. Lett Appl Microbiol 28:300-304. Magan N (1993). Early detection of fungi in stored grain. Int Biodeterior Biodegrad 32:145-160. Magan N (1997). Fungi in extreme environments. In: Wicklow DT, Soderstrom B eds. MYCOTA Vol. IV. Environmental and Microbial Relationships. Berlin: Springer Verlag. Magan N and Evans P (2000). Volatiles as an indicator of fungal activity and differentiation between species, and the potential use of electronic nose technology for early detection of grain spoilage. J Stored Prod Res 36:319-340. Magan N and Lacey J (1984a). Effects of temperature and pH on water relations of field and storage fungi. Trans Br Mycol Soc 82:71-81. Magan N and Lacey J (1984b). Effects of gas composition and water activity on growth of field and storage fungi. Trans Br Mycol Soc 82:305-314. Magan N and Lacey J (1984c). Effects of water activity, temperature and substrate on interactions between field and storage fungi. Trans Br Mycol Soc 82:83-93. Magan N and Lacey N (1985). Interactions between field and storage fungi on wheat grain. Trans Br Mycol Soc 85:29-37. Magan N, Jenkins N, and Howarth J (1993). Lipolytic activity and degradation ofrapeseed oil and rapeseed by spoilage fungi. Int J Food Microbiol 19:217227. Marfleet I, Magan N, and Lacey J (1991). The relationship between fungal biomass, ergosterol and grain spoilage. In: Fleurat-Lessard F, Ducom P, eds. Proceedings of 5th Int. Working Conference of Stored Product Protection, Bordeaux, France, Imprimerie du medoc, Vol. I, pp 405 -412. Marin S, Sanchis V, Teixido A, Saenz R, Ramos AJ, Vinas I, and Magan N (1996). Water and temperature relations and microconidial germination of Fusarium moniliforme and F. proliferatum from maize. Can J Microbiol 42:1045-1050. Marin S, Sanchis V, Saenz R, Ramos AJ, Vinas I, and Magan N (1998a). Ecological determinants for germination and growth of some Aspergillus and Penicillium spp. from maize grain. J Appl Microbiol 84:25-36. Marin S, Sanchis V, Rull F, Ramos AJ, and Magan N (1998b). Colonization of maize grain by Fusarium moniliforme and Fusarium proliferatum in the presence of competing fungi and their impact on fumonisin production. J Food Prot 61:1489-1496. Marin S, Sanchis V, Ramos AG, and Magan N (1998c). Environmental factors, interspecific interactions, and niche overlap between Fusarium moniliforme and F. proliferatum and Fusarium graminearum, Aspergillus and Penicillium spp. isolated from maize. Mycol Res 102:831-837. Marin S, Sanchis V, Ramos AJ, and Magan N (1998d). Effect of water activity on hydrolytic enzyme production by Fusarium moniliforme and Fusarium proliferatum during colonisation of maize. Int J Food Microbiol 42:185-194. Marin S, Magan N, Belli N, Ramos AJ, and Sanchis V (1999a). Two-dimensional profiles of fumonisin B1 production by Fusarium moniliforme and Fusarium proliferatum in relation to environmental factors and potential for modelling toxin formation in maize grain. Int J Food Microbiol 51:159-167. Marin S, Magan N, Serra J, Ramos AJ, Canela R, and Sanchis V (1999b). Fumonisin B1 production and growth of Fusarium moniliforme and Fusarium proliferatum on maize, wheat, and barley grain. J Food Sci 64:921-924. Marin S, Homedes V, Sanchis V, and Magan N (1999c). Impact of Fusarium moniliforme and F. proliferatum on calorific losses and fumonisin production under different environmental conditions. J Stored Prod Res 35:15-26. Multon JL (1988). Interactions between water and the constituents of grains, seeds and by-products. In: Multon JL ed. Preservation and Storage of Grains, Seeds and Their By-products. Lavoisier: Lavoisier Publishing. Northolt MD (1979). The effect of water activity and temperature on the production of some mycotoxins PhD dissertation, Bilthoven, Holland. Olssen J, Borjesson T, Lundstedt T, and Schnuerer (2002). 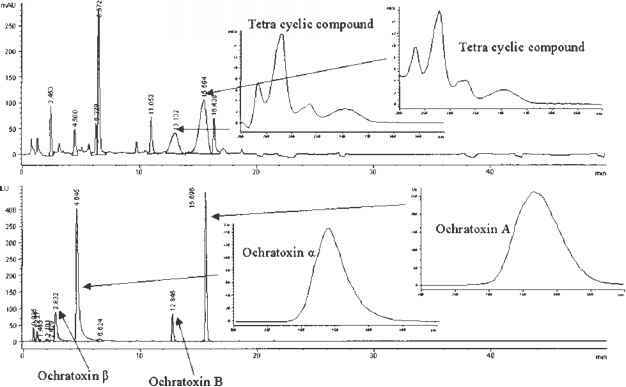 Detection and quantification of ochratoxin A and deoxynivalenol in barley grains by GC-MS and electronic nose. Int J Food Microbiol 72:203-214. Papendick R and Mulla D (1985). Basic principles of cell and tissue water relations. In: Ayres PG, Boddy L eds. Water, Fungi and Plants. Cambridge: Cambridge University Press. pp 1-25. Pelhate J (1988). Ecology of the microflora of grains and seeds. In: Multon J ed. Preservation and Storage of Grains, Seeds and Their By-products. New York: Lavoisier Publishing. pp 244-262. Perez RA, Tuite J, and Baker K (1982). Effect of moisture, temperature, and storage time on the subsequent storability of shelled corn. Cereal Chem 59:205-209. Petersson S and Schnurer J (1998). Pichia anomala as a biocontrol agent of Penicillium roqueforti in high moisture wheat, barley and oats under airtight storage. Can J Microbiol 44:471-476. Petersson S, Wittrup Hansen M, Hult K, and Schnurer J (1998). Ochratoxin A accumulation in cultures of Penicillium verrucosum with the antagonistic yeast Pichia anomala and Saccharomyces cerevisiae. Mycol Res 102:1003-1008. Pitt JI (1975). Xerophilic fungi and the spoilage of foods of plant origin. In: Duckworth RB ed. Water Relations of Food. London: Academic Press. pp 273-307. Pixton S (1967). Moisture content—its significance and measurement in stored products. J Stored Prod Res 3:35-47. Prasad T and Prasad RB (1982). Changes in calorific value of Linum usitatsimum L due to seed borne fungi. Biol Bull Ind 4:136-239. Ramos AJ, Magan N, and Sanchis V (1999a). Osmotic and matric potential effects on growth, sclerotial production and partitioning of polyols and sugars in colonies and spores of Aspergillus ochraceus. Mycol Res 103:141-147. Ramos AJ, Munoz J, Marin S, Sanchis V, and Magan N (1999b). Calorific losses in maize due to colonisation by isolates of Aspergillus ochraceus under different environmental conditions. J Cereal Sci 29:177-183. Rohani MY, Shariffah Norin SA, and Samsudin A (1985). Post-harvest losses of paddy in the Krian/Sungei Manik areas. MARDI Res Bull 13:148-154. Schnurer J, Olsson J, and Borjesson T (1999). Fungal volatiles as indicators of feed and food spoilage: a review. Fungal Genet Biol 27:209 -217. Scott W (1957). Water relations of food spoilage micro-organisms. Adv Food Res 7:83-127. Seitz LM, Mohr HE, Burroughs R, and Sauer D (1977). Ergosterol as an indicator of fungal invasion in grains. Cereal Chem 54:1207-1217. Seitz LM, Sauer DB, and Mohr HE (1982). Storage of high moisture corn: fungal growth and dry matter loss. Cereal Chem 59:100-105. Sinha RN (1982). Food losses through energy transfer from cereal grains to stored-product insects. Food Nutr Bull UN Univ 4:13-20. Sinha RN (1995). The stored grain ecosystems. In: Jayas DS, White NDG, Muir WE eds. Stored Grain Ecosystems. New York: Marcel Dekker. pp 1 -32. Sinha RN, Madrid FJ, and White NDG (1986). Bioenergetics of Ephestia cautella (Walker) (Lepidoptera:Phycitidae) feeding on stored wheat. Ann Entomol Soc Am 79:622-628. Tothill IE, Harris D, and Magan N (1993). The relationship between fungal growth and ergosterol in wheat grain. Mycol Res 11:965-970. Tuite J, Koh-Knox C, Stroshine R, Cantone FA, and Bauman LF (1985). Effect of physical damage to corn kernels on the development of Penicillium species and Aspergillus glaucus in storage. Phytopathology 75:1137-1140. Tuma D, Sinha RN, Muir WE, and Abramson D (1989). Odor volatiles associated with microflora in damp ventilated and non-ventilated bin-stored bulk wheat. Int J Food Microbiol 8:103-119. Vasan BS (1980). Handling of high moisture paddy during wet season—a practical approach to existing problems. Bull Grain Technol 18:223-232. Wallace HAH and Sinha RN (1981). Causal factors operative in distributional patterns and abundance of fungi: a multivariate study. In: Wicklow DT, Carroll GC eds. The Fungal Community—Its Organisation and Role in Ecosystems. New York: Marcel Dekker Inc. pp 233-247. White NDG, Sinha RN, and Muir WE (1982). Intergranular carbon dioxide as an indicator of biological activity associated with the spoilage of stored wheat. Can Agric Eng 24:35-42. Wicklow DT (1988). Patterns of fungal associations within maize kernels in North Carolina. Plant Dis 72:113-115. Wilson M and Lindow S (1994a). Coexistence among epiphytic bacterial populations mediated through nutritional resource partitioning. Appl Environ Microbiol 60:4468 -4477. Wilson M and Lindow S (1994b). Ecological similarity and co-existence of epiphytic ice-nucleating (Ice+) Pseudomonas syringae strains and a non-ice nucleating (Ice—) biological control agent. Appl Environ Microbiol 60:3128-3137. Zeleny L and Coleman DA (1938). Acidity in cereals and cereal products, its determination and significance. Cereal Chem 15:580-595.